In a medium bowl, combine all the ingredients together. Spread everything out on a lined baking tray. Toast in the oven for 15-20 minutes, until the coconut chips start browning. About halfway through, gently use a spatula and give everything a mix. Allow to cool before snacking. Store in an airtight container. 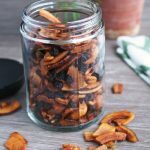 Get this recipe for Rosemary and Cayenne Coconut Chips (Toasted Trail Mix) at https://www.theworktop.com/breakfast-brunch-recipes/cayenne-coconut-chips/.